It’s all about wok hay. But for those of us without restaurant woks and their ferocious heat, check out my tips & tricks for perfect home-style Chinese Fried Rice. I have been in love with Chinese Fried Rice for as long as I can remember. Our family was Catholic, and we didn’t eat meat on Friday. Thus, Dad instituted what he called “Chinese Joint” night and every Friday evening, you could find our family of four at one of the many Chinese restaurants that dotted the Seattle cityscape. We even made it to Chinatown on a few special occasions. Chinese Joint night was special, because we each got to order the one dish we wanted most. Then oddly, by today’s standards anyway, we ate only our own dish. That was fine by me. The only dish I craved was Shrimp Fried Rice. Mom ordered Egg Foo Yung, in its horrid salty brown sauce and my brother Dan ordered Chow Mein with its ghastly packaged fried noodles and ton of bean threads. I would have loved some of Dad’s deep-fried prawns, but I wouldn’t have traded my Shrimp Fried Rice for them. Then when I was around 10, in a burst of hunger and enthusiasm, I decided to make Fried Rice myself. How hard could it be? I followed the recipe in Mom’s Betty Crocker cookbook, expecting a masterpiece. It was ghastly—as in inedible. My rudimentary cooking skills may have been partly to blame, but today I know the real culprits were the ingredients and the recipe. We didn’t have the correct rice in the house. In fact, we rarely ate rice. Most likely, I used Uncle Ben’s Converted Rice. And it would have been hot, not cold. In addition, the recipe called for a foolhardy amount of soy sauce, which even at that young age, I questioned as I poured it in. So, at long last, I am going to set things right. 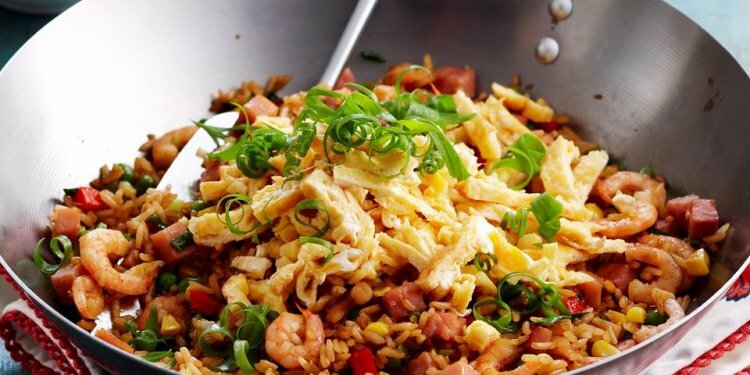 You CAN make wonderfully delicious Fried Rice at home. It may be the most delicious fried rice you have ever had. It will not, however, taste like Restaurant-Style Chinese Fried Rice. I know, because I have spent years trying. I tried them all. No luck. They are each a tasty addition if used in the proper proportions, but none produces the indefinable flavor of Restaurant-Style Chinese Fried Rice. One cook said to just go to Benihana and watch how they prepare Fried Rice. The problem with that suggestion is that Benihana’s Fried Rice, although tasty, doesn’t have the illusive flavor. Wok hay is the breath, energy, and spirit of a wok, the seared, smoky taste obtained with proper stir-fry technique and a crazyhot restaurant wok.